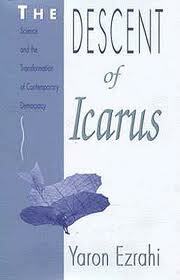 The Descent of Icarus research papers overview the famous Ovid poem, the author of the Metamorphosis. Often Ovid is content with action and does not tell us much about the motivations of the fascinating characters. The purpose of a revision in “The Descent of Icarus” is to assign a motive to Icarus’ fatal descent. What could compel a son to disobey his father and fly too close to the sun? Youthful exuberance may be one explanation. Ordinary, teenage obstinance and rebellion might be another. But the explanation one may chose for this poem was a son’s desire to make his own mark and try to emerge from the shadow of a famous father. Like many sons of famous fathers, Icarus fails in his attempt. In this case, the price is his life. The “altered ends” I’m attempting to achieve are that Icarus is really trying, in my poem, to reach greater heights at any cost. If he dies trying, he will at least have the satisfaction of having given it his best. This revision of the poem makes the element of flight a metaphor for Icarus’s desire to rise above his father – or at least reach the heights to which his father has ascended as a famous architect and inventor. This imagery of flight and achievement informs the work from the beginning. Because the poem is in first person, we are able to understand what Icarus is feeling and why he might take a risk that seems rash. By choosing this form for my revision, I hoped to convey the complexity of his motivation. The yearning voice of Icarus in the poem is designed to express the emotion he feels. Paper Masters writes custom research papers on The Descent of Icarus and overview the famous Ovid poem, the author of the Metamorphosis.